Good point. I agree and we should build more training evolutions that allow the TICs use. Other than oriented search training and/or where the training objective is about no vision we should be using and/or at least carrying it with it turned off. Its a catch 22 and has been discussed at major conferences on when to and to allow use of TIC. 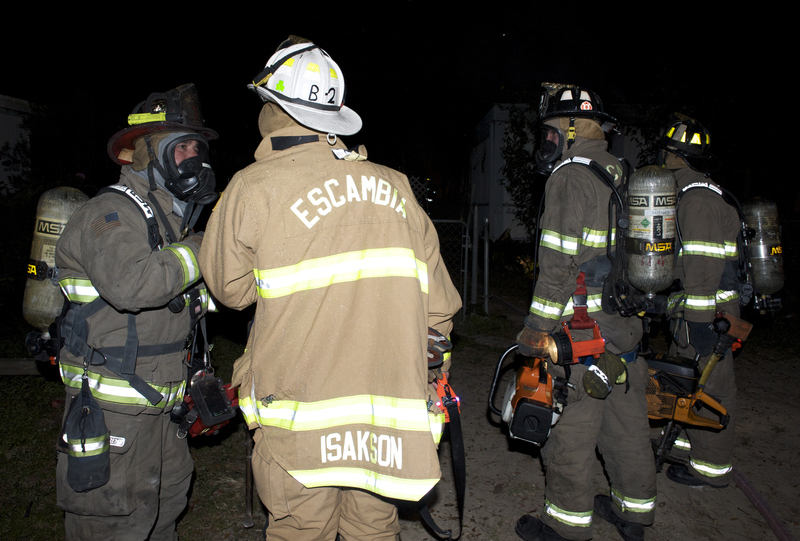 The reason so many Insturctors don’t allow is it does make it so easy to see, especially in training smoke. WE NEED MORE LIVE SMOKE TRAINING! Thanks for posting. Stay Safe and carry your vision. Use it as a tool but not your only knowledge of operating in burning buildings. I think the TIC is an awesome piece of technology, but in our case we have become overreliant on it and it is over-utilized. It is still not a substitute for pulling ceilings and walls down to verify extension (or lack thereof). Also, members must understand that batteries go dead and they get dropped. Yes, always carry it attached to my air pack. Just last shift I used it to find where in a wall hidden fire was, at an electrically started attic and wall fire. That kept us from pulling ceiling in areas that weren’t needed. Used it later that night to find where in an attic cellulose insulation was smoldering and it kept us from having to pull the entire ceiling and gave us an indication of heat so we knew if we had time to move the occupants belongings and set up tarps before we made the mess. We were able to set up tarps, get some of their belongings out of the way and saved quite a bit of their stuff. That night I wore through both of our batteries, if we would have gotten put on another fire we would have been working on fumes. The batteries get old and lose charge life no matter how well you maintain them. I have also used it to size up an attic fire when it had smoke pushing everywhere and I was able to pinpoint the location of the fire to start the attack. Great tool. This last weeks of training only confirmed the superiority of the TIC….faster safer and more reliable. I know how my search process will be changed! This is a great subject & the training Chief Ike is referring to definately, at least for me, identified an immediate training area in my department….the need for TIC training! I utilized this piece of equipment for 9 years as a captain & I gotta say, hands down it is the best advancement the fire service has seen in the last 2 decades. Once trained with this tool, it becomes a huge asset (& not just with fire situations); however, as stated already it is just another tool and & should not replace our traditional search & extinguishment techniques….it should simply enhance them greatly! I have seen many training situations where they are not allowed to be utlized. Personaly I think that is a mistake….the only way we can get better at using them (or should I say at least comfortable) is to use the crap out of them during training. It is simply unacceptable (& some would argue negligent) that officers are not utlizing this equipment or not familiar with it. I would propose a simple question to those this applies to; if it was your son, your daughter, your family, you were going to rescue…..would you approach training & competecy with the TIC a little different?? (Ya, I know I am preaching to the choir on this web site) So the next question….who should have it. This is simple & straight forward. 99.9% of the time, the officer! He leads, directs, & insures that the company succeeds. How can he do that if someone else has the TIC. 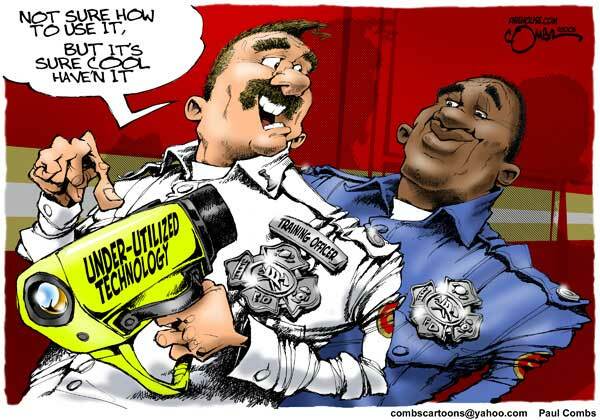 If you are trained in the use of it & are competent, the officer should be the primary user of it. Furthermore, he should take every opportunity to train his people how to use it competently. I keep stating competent because there is a difference between using it & using it competently. Ironically I had a long talk with one of my engine companys this morning about TIC training and alot of these questions came up. FOR ALL COMPANY OFFICERS—BOTTOM LINE- get out and train with it & train your people with it. Pull up articles & read them, educate yourselfs & educate your firefighters. Then, go apply it practically in actual HOT training! 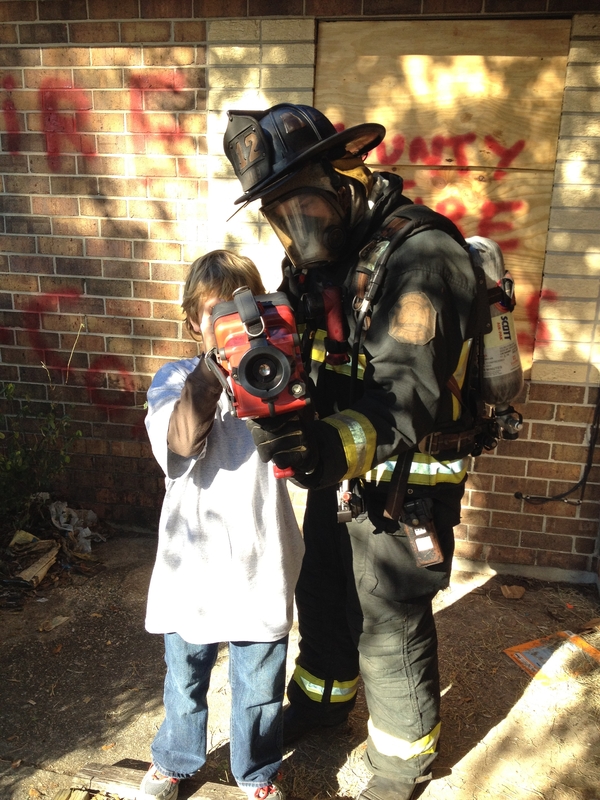 Take every opportunity, such as the ones Brian mentioned, to use the TIC & “Tail board critique” with your firefighters. Show them what you see & train them to be better than you! The buck stops with the CO, the company succeeds & the firefighters get the credit, the company fails & the officer gets the blame….& rightlfully so. The public & our families expect nothing less! TIC’s are also helpful in non-fire but rescue related calls. For example a TIC can be used in a water rescue operation to scan the surface of the water in low visibility to assist rescue divers to ascertain a “last seen point” which is vital in water rescue if the victim becomes submerged. No a TIC will not pick up any kind of heat signature subsurface but it will pick up heat at surface level, which is great for low light or decreased visibility searching. The same technique is used by rescue helicopters and boats with their ‘FLIR’ (forward looking infared camera) mounted units. However a first arriving truck or engine company land unit can start a preliminary surface visual search with their portable TIC unit. Good points Tom. Some other uses would include-Haz-Mat calls; we used TICs to assist with vapor release (different temps) & hazardous fluids…this is especially helpful at night when visibility is limited. Gas leaks (vapor)- sometimes detects a significant leaks from the source although you usually have other obvious indicating factors but it helpd reinforce what you think is the case. Vehicle accidents….used them looking for additional victims that have been ejected into a wooded area. Crews just used the TIC last tour for a smoldering fire in a patch of woods…smelled it but couldnt find the source…TIC comes into play. All kinds of great uses for the good old TIC! I have had the chance to use it at numerous fires. I agree with everyone. It’s a great tool, but should not be soley relied on during a search. Things happen wether it is lost or broken, dead batteries, ect. I have also had the chance to use it with some kid who decided to take an ocean swim one night. We are able to spot him with no problems. We recently had a vehicle rollover with a few ejections. The TIC helped locate one that was thrown into the woods. I also used it one night to find the driver of a flipped pickup truck. This driver was hiding, but in an MVA with ejection it can be a good tool to keep you from being embarrassed once the sun rises and another body is found. It is certainly just another tool in the tool box, but remember some of the best uses for our tools are the ones that weren’t originally intended. I actually rarely use mine as the search tool it was intended. I prefer simply to scan a room and then search. These days with a lack of sufficient manpower I can’t afford the time lost by sitting in a hallway and scanning rooms as the crew (one other guy) searches. I have to be involved in the search myself and I trust my sense of feel more than I do an image on a screen, especially when due to thermal dymanics you really aren’t sure what color a body will show up. Each fire will present different thermal images for the room itself and the person could be warmer, cooler, or even near the same temp as many of the things in the room and therefore you must still rely heavily on your senses, search techniques, room orientation, and common sense to conduct an adequate search. I try to search each house as if I am looking for my own kids. One of the largest issues with this tool is the general lack of understanding how it functions and what are it’s capabilities and limitations (dependant on type). The fire service is saturated with so many different types and models that training on “this” model does not mean you can properly use and interpret “that” model. Training without live fire only sets the stage for failure. The end user must be able to view images over a wide range of temperatures in order to form a complete understanding. A lot of good comments and like someone stated before the more you use it the better you’ll be with it. Thanks for every other informative web site. Where else may I am getting that type of information written in such an ideal means? Hi there, I discovered your blog via Google while looking for a comparable matter, your web site came up, it appears to be like good. Iâ€™ve bookmarked it in my google bookmarks. mind that how a user can know it. Thus that’s why this article is perfect. the web site containing grammatical mistakes, typos as well numerous other mistakes because there’s a possibility of accessing a bogus internet site somewhat than true one. Nowadays, laptop or computer supervisor exist broken down in CRT in addition to LCD watch. of appear furthermore touch reminiscent in the TELLY. Their central hardships are the importance with amount. aspects of the device is frequently lesser appearance condition. so you need to make it a point that you will chec it regularly. and feedbacks from their past clients. your blogg and I look forward to your new updates. there are lots of tiles, buttons and menu entries. a sense of cohesion. I discovered the way to make money on the internet. Reblogged this on FIREFIGHTER RESCUES.